Scottish football club Raith Rovers has unveiled a new away strip that commemorates the sacrifice made by its players during World War I. The Kirkcaldy club wanted to mark the Centenary of World War I and to pay tribute to the seven Raith players who joined the 16th Royal Scots which included in its ranks numerous Scottish footballers. The unit was founded by Sir George McCrae and was often referred to as ‘McCrae’s Battalion’. Three, namely Jimmy Todd, Jimmy Scott and George McLay, lost their lives during the fighting. Todd played as a winger, had worked as a railway clerk and was killed by artillery fire in March 1916. Scott, a 21-year-old forward, lost his life on the first day of the Battle of the Somme. His name appears on the Thiepval memorial to the missing. McLay, a 28-year-old midfielder, was killed while attacking a German pillbox during the Third Battle of Ypres. At the time he was serving as a sergeant and was awarded a posthumous Military Medal for his actions. Some 10 additional Raith players served with other units. 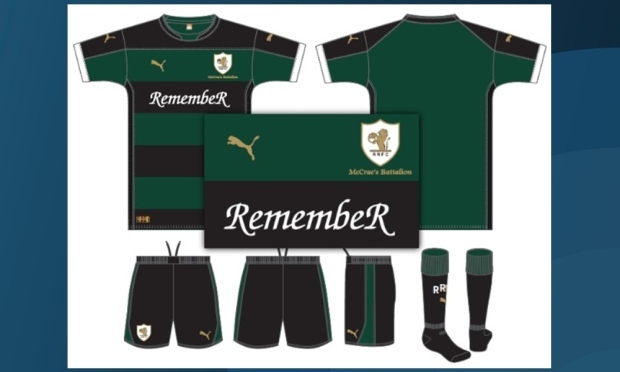 The new away strip, which will be worn from the 2014-2015 season, is in the green and black colours of the Hunting Stewart tartan worn by the Royal Scots Regiment. This entry was posted in Events and tagged Centenary of World War I, football and World War I, George McLay, Jimmy Scott, Jimmy Todd, Kirkcaldy, McCrae’s Battalion, Military Medal, news, Raith Rovers, Raith Rovers kit, Scotland in World War I, Turnbull Hutton, UK News. Bookmark the permalink.